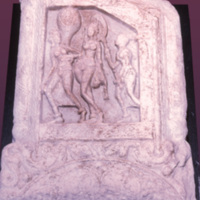 Description: This one-time queen turned beggar, carrying her crippled lover, an illustration of the Cullapaduma Jataka (one of the former birth stories of the Buddha) at the Tivanka Image House. 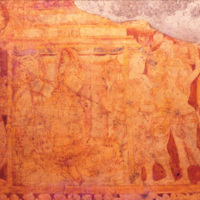 Description: Many of the 12th and 13th century A.D. paintings at the Tivanka Image House in Polonnaruva are faded. However, some episodes from the life of the Buddha as well as Jataka stories can be identified. 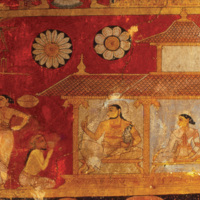 This scene shows a group of elite women associated with the events preceding the birth of prince Siddhartha. 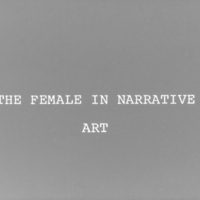 Description: The female in narrative art: A useful source for the study of conceptual positions regarding women in early Sri Lankan society is narrative art, which is largely in the form of painting. Unfortunately the chronological distribution of this material is extremely uneven, being weighted on the last two centuries of the period dealt with in this survey. Very little of the narrative paintings of the earlier period has survived. 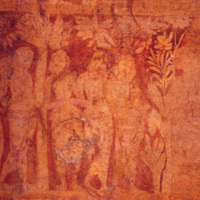 Description: Painted on the ceiling of the ground floor of the Temple of the Tooth in Kandy is this group of Kinnari (female Kinnara) maidens in combination. 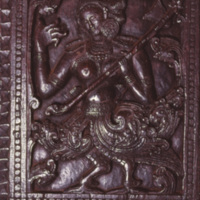 Description: This is a 17th century A.D. wood carving of a Kinnari (female Kinnara) holding a musical instrument at the Ambakke devalaya, Sri Lanka. 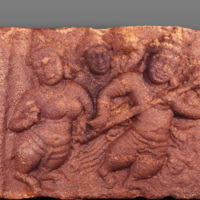 Description: Exhibited at the Museum in the Isurumuniya temple premises is this group of Kinnaras among whom is a Kinnari (female Kinnara). Traditionally they are thought to be heavenly musicians. Here the male carries a musical instrument. 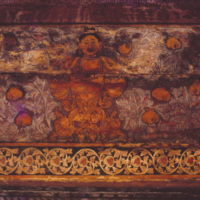 The stone carving has been dated to about the 5th or 6th century A. D.
Description: An elaborate narilata motif which consists of the central female forms and a host of other female heads within the creeper design is seen painted on the wooden ceiling of the ground floor of the Temple of the Tooth in Kandy, Sri Lanka. 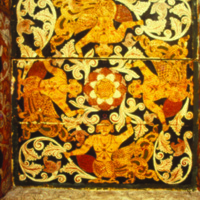 It is a rare form of the narilata motif and serves a decorative purpose. 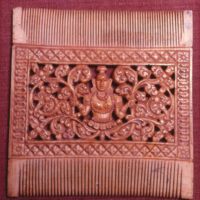 Description: This comb with a carving of a Narilata is one of a large selection of ivory combs of the Kandyan period exhibited at the Colombo National museum.